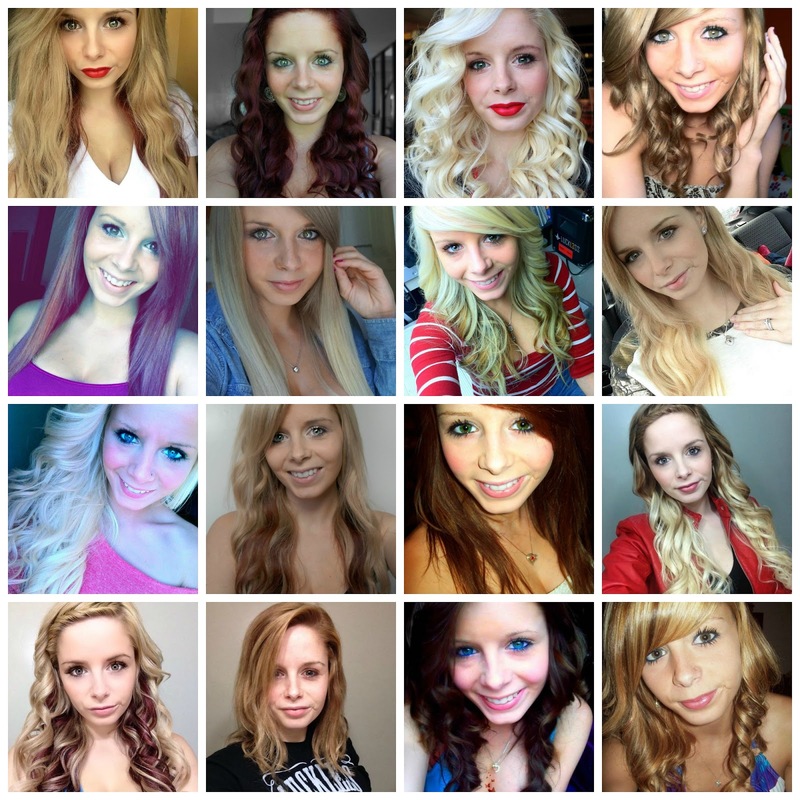 First I would like to take the time to give you all a quick introduction of Whitney and her journey. 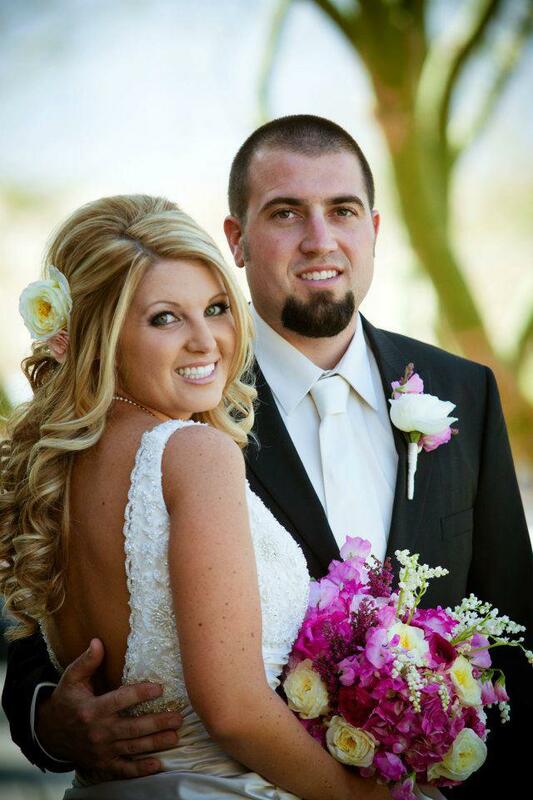 Ten years ago Nick and Whitney met. Whitney finally got her BFP! 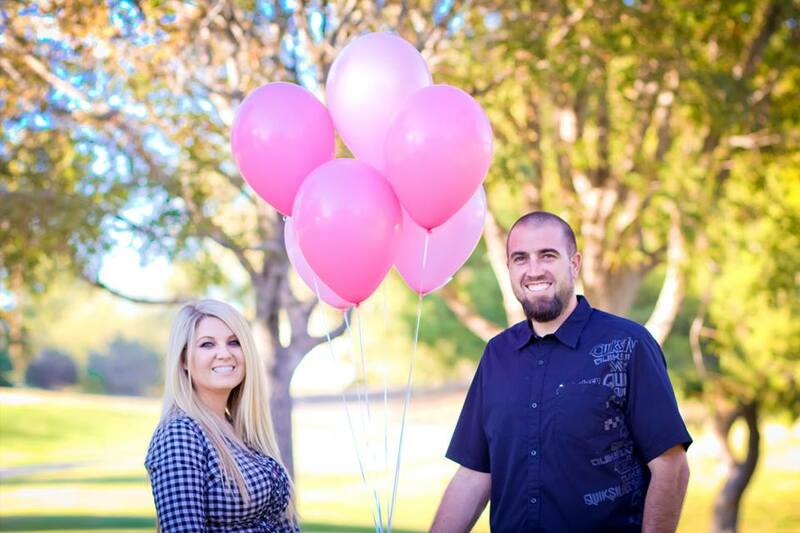 a baby girl expected April 2014! 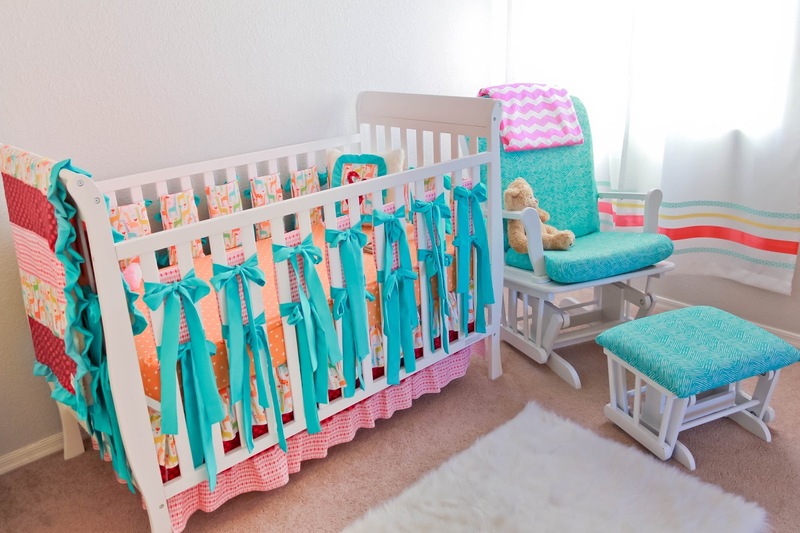 Now I get the pleasure of sharing her adorable nursery with you all! 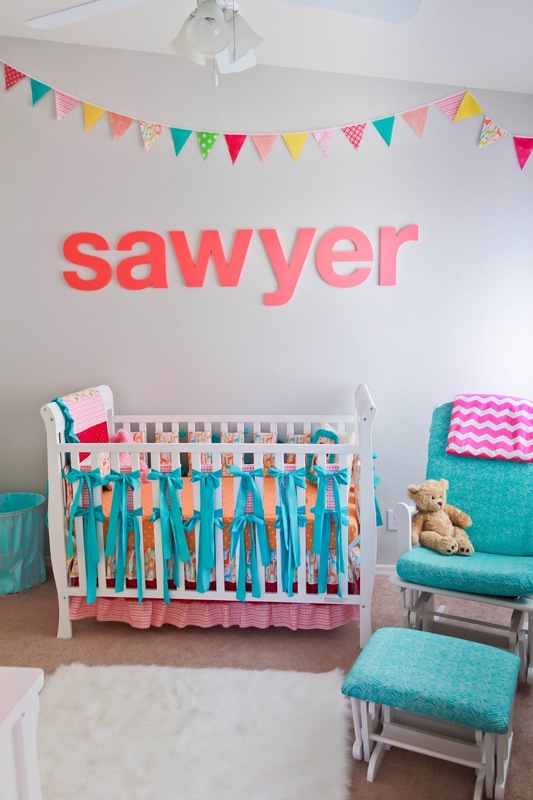 So as the days get closer to baby Sawyer's arrival, I think we can finally say we have completed her nursery. For now, at least. I am always adding new projects here and there. Krystal did an amazing job. 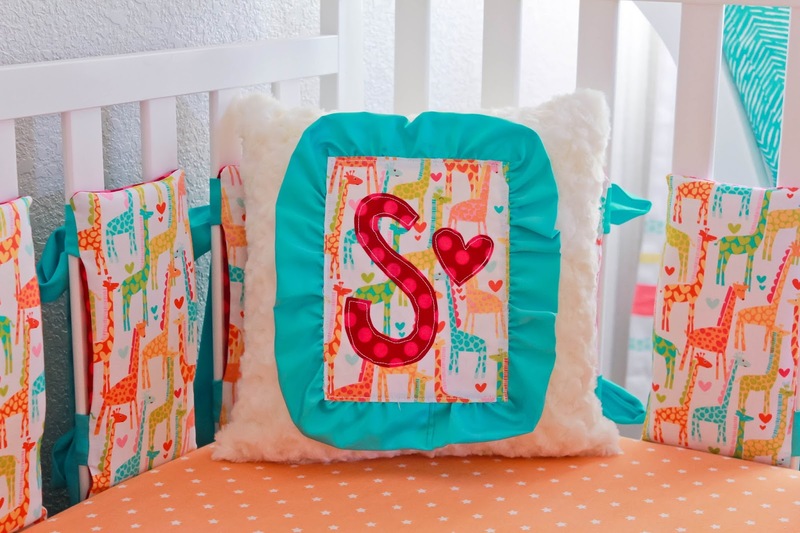 She actually bought the giraffe fabric while we will still trying to conceive last year with her fingers crossed we would have a girl, and I am so glad that she did. 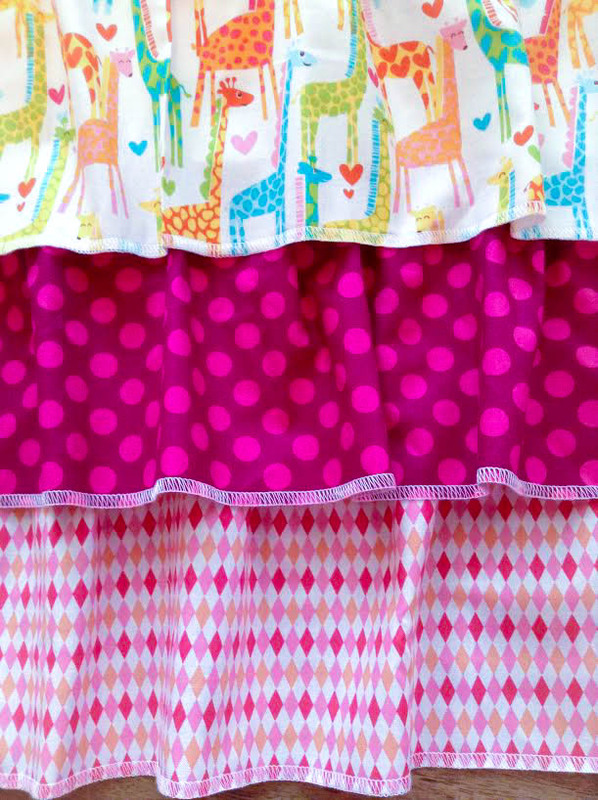 The giraffe fabric is "giraffe love" by Michael Miller Fabrics. 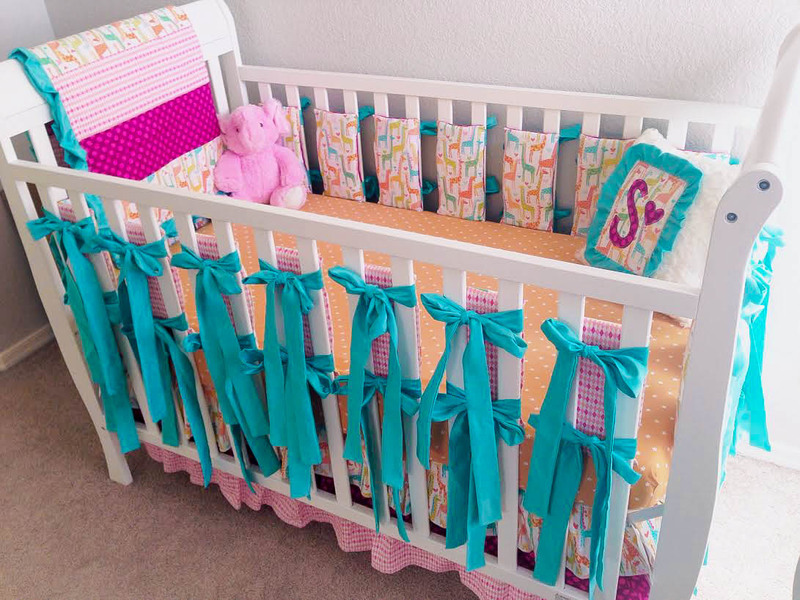 The crib sheet is from Target, she provided me with a crib sheet as well but I wanted to bring a little orange in the room. 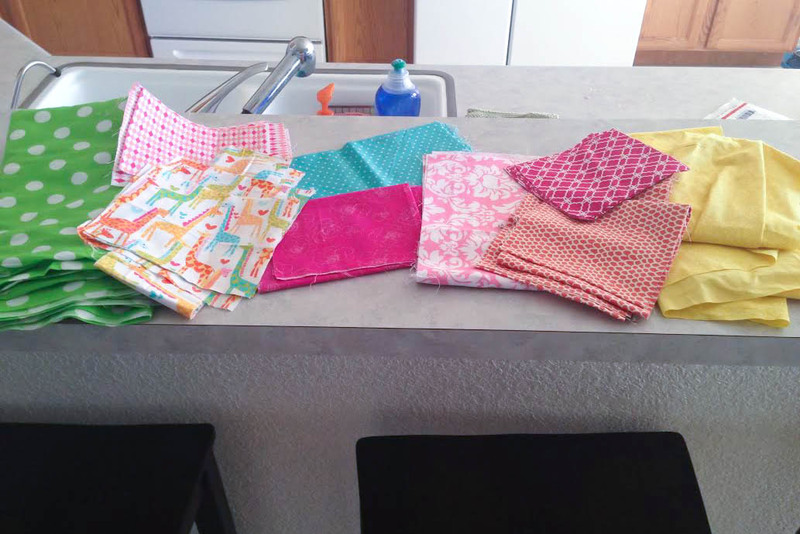 Krystal also so very graciously sent me some free scraps she had from not only my crib set but some other coordinating fabrics as well. 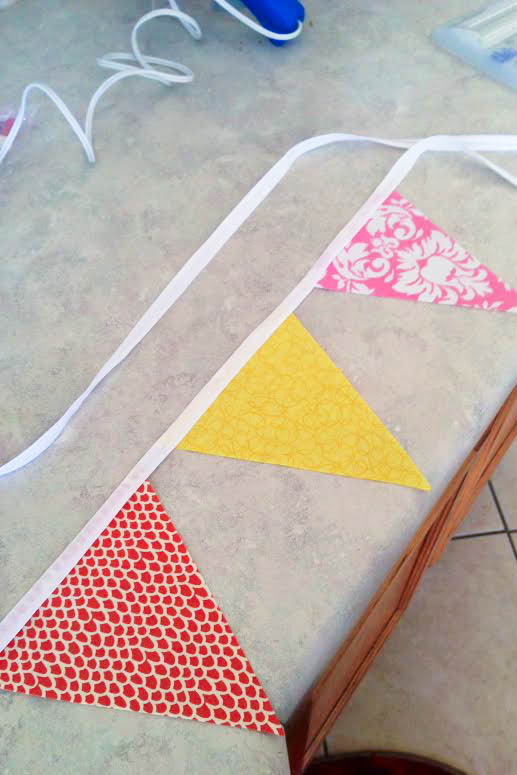 I went ahead and made the flag bunting that goes around the 2 walls of her room with those scraps and some 1/2 inch bias tape, the entire project ran me about $3.60 or so. I went to Hobby Lobby and bought 2 packs of 1/2" white bias tape (in the quilting section). They run for $1.79 a pack and are 4 yards in length each. I thought about sewing them all on, but then decided to use my hot glue gun. 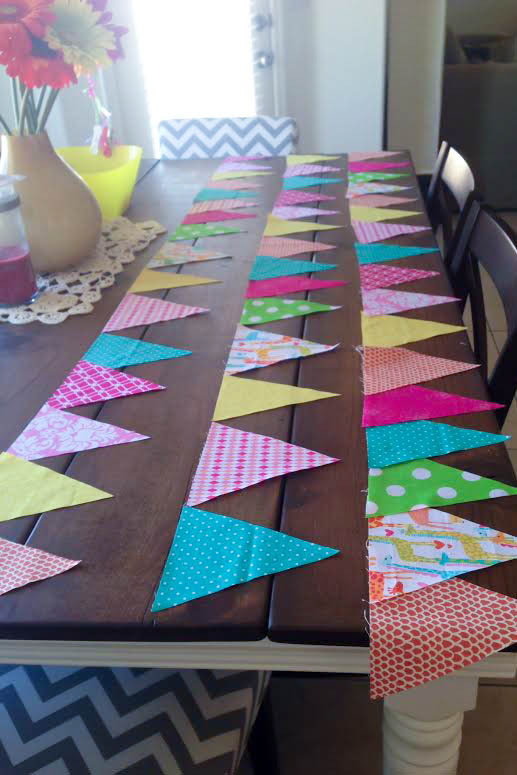 I had some gluesticks left over from a wedding project that were made specifically for fabric so those did the trick! 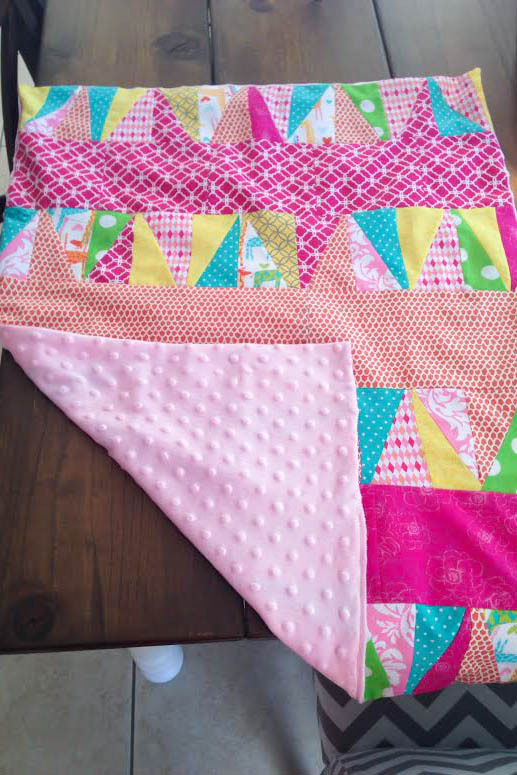 Since I have a problem wasting anything that can be put to good use, I also used the scraps I made from cutting out the triangles and made this cute little snuggle blanket. It cost me roughly $3.50 for 1/2 yard of pink dimple dot Minky fabric from Walmart. They are 16" tall, 1/2 thick, Helvetica font. They were $14.15 each, bringing my grand total with out shipping to $84.90. I bought these during Black Friday so I was able to use a code for free shipping. For the paint color I went with Valspar Passion Pink. 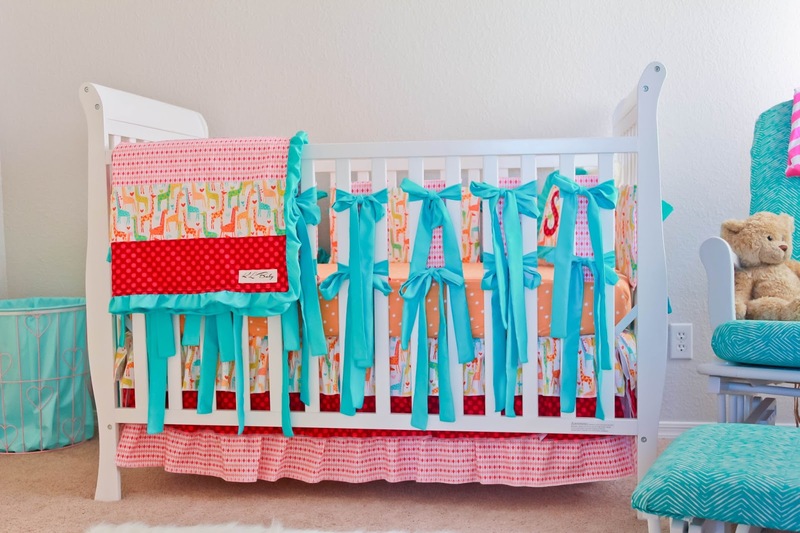 It is a perfect girly coral color. I only bought the sample paint size and have plenty left over for additional projects down the road. A sample at our local Lowes is $2.98 and I am more than happy with how they turned out. They fit the wall size perfectly. The glider and ottoman I bought on a local buy-sell-trade facebook site. It was originally a natural light wood with a tan tweed cushion. I painted the chair base high gloss white and my mom recovered the cushions in fabric from fabric.com! as well as some iron-on hem tape, and made them in about 30 minutes. 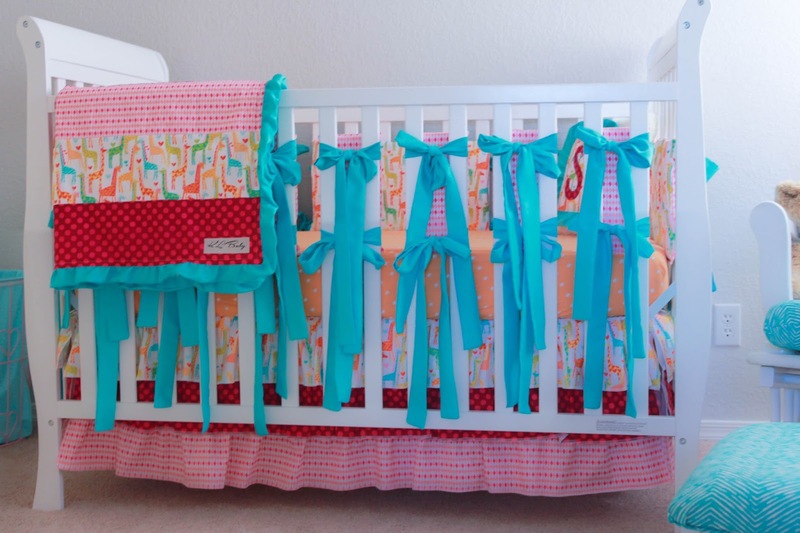 The curtain panels were under $10 each and the ribbon and hem tape were around $12. 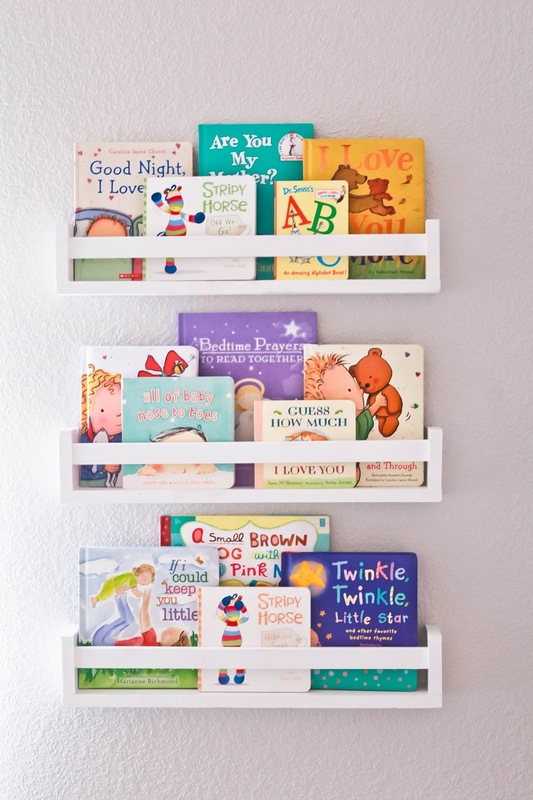 The bookshelves are also handmade. I love how they display the book covers! A good friend of mine made them from 1x3's and painted them white to match the rest of the furniture. 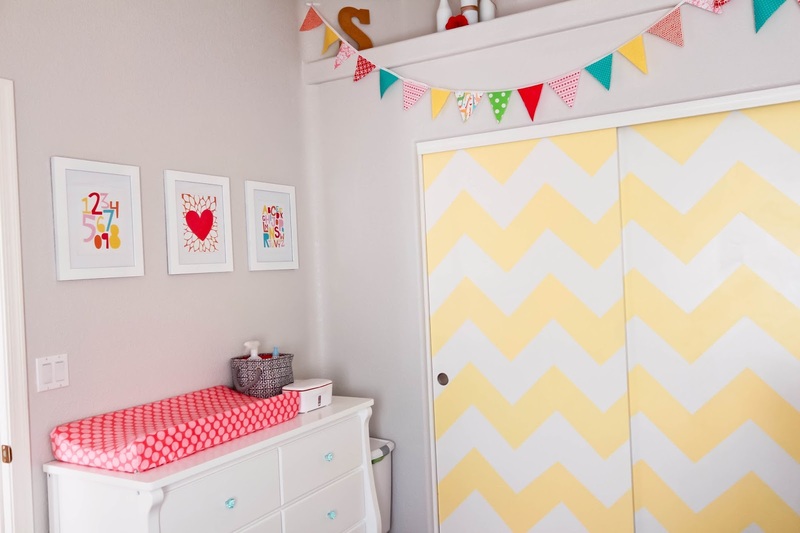 I love the closet doors. 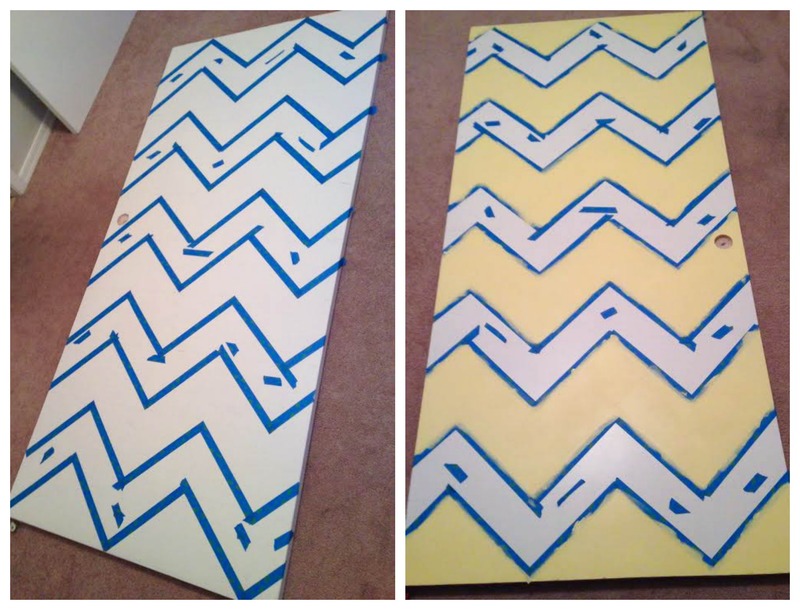 They were very, very, very time consuming to measure, tape, and paint, but in the end they were SO worth it! The paint is Lemon Drops by Behr at Home Depot. 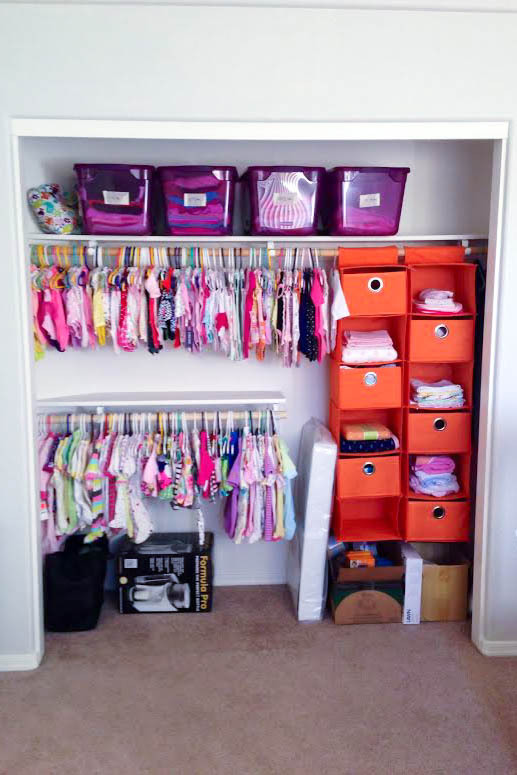 The inside of the closet has her clothes from newborn to 3 months hanging. 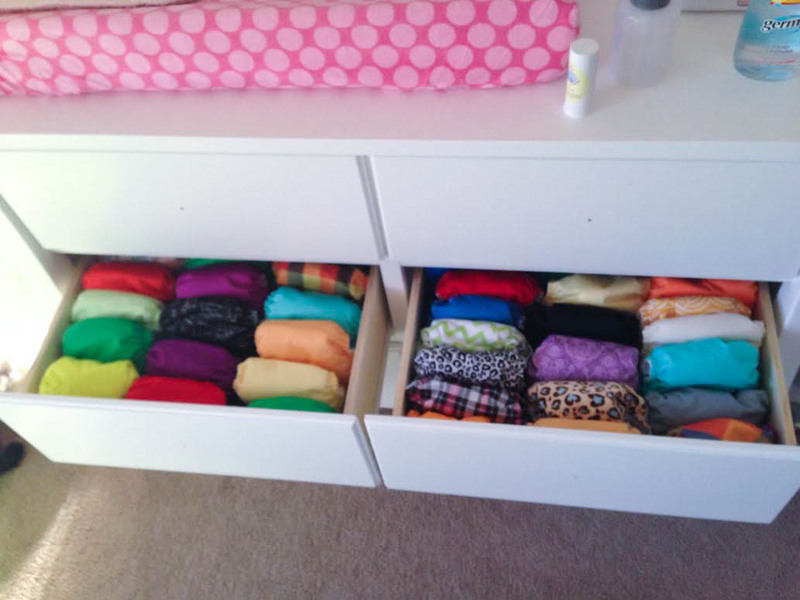 It also has a spot for blankets, pants, socks, bows, etc. The hanging organizer and bins are from www.landofnod.com. I had a Christmas discount code so the total with shipping and tax after the discount was $75.24! 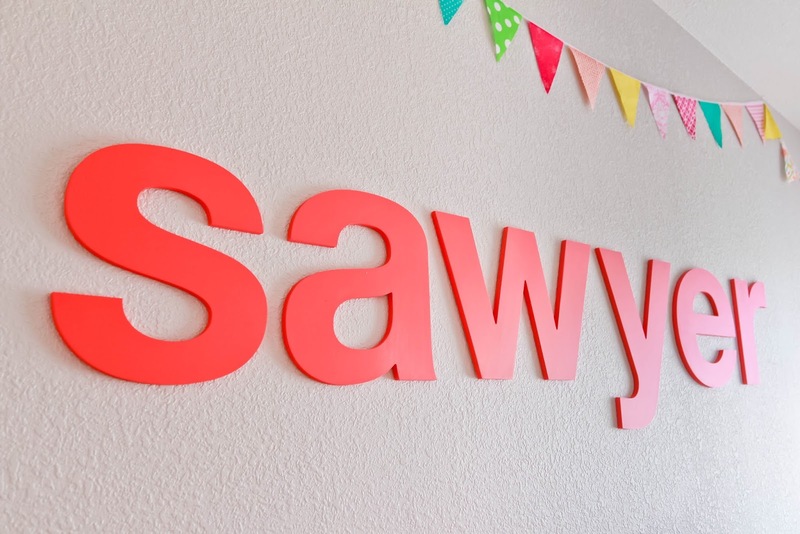 My handy husband did a weekend project adding a second shelf and pole for all of Sawyer's little bitty clothes. The purple bins above are from Walmart. I got a lot of hand me downs so I organized them by size to make it easier when Sawyer grows into them. 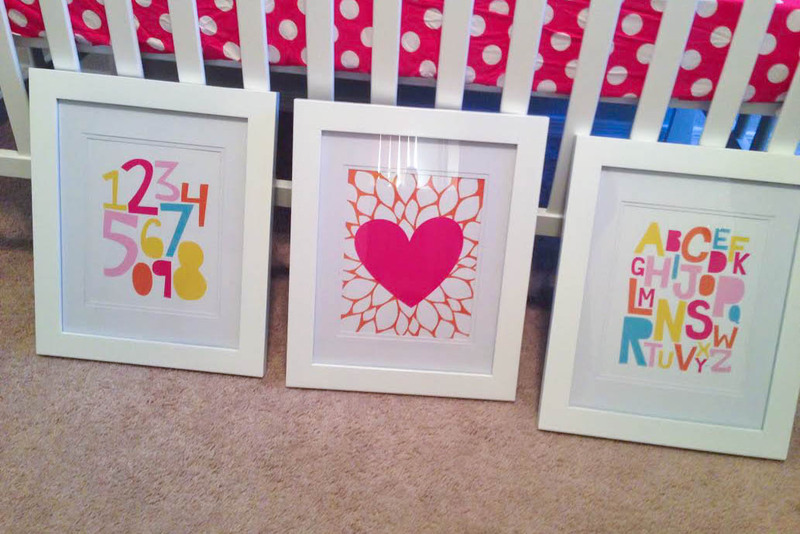 The art above the changing table is a custom set PDF set I purchased from babyartprints on Etsy. 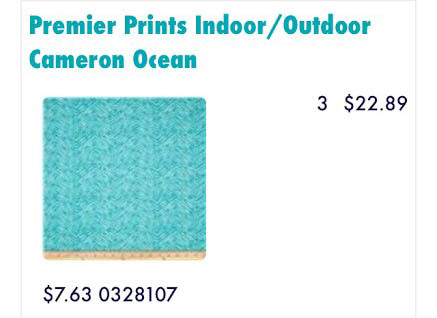 I paid $9 for the PDF, I then uploaded it to Staples.com and printed the 3 pictures for $3.17 with tax. The frames are from Walmart. They were $38.73 with tax for the 3. The only problem was they were BLACK. So, I painted them with some left over paint from the glider. The dresser my mom and dad bought as a gift for Sawyer from amazon.com. I ordered the blue acrylic knobs from ebay. 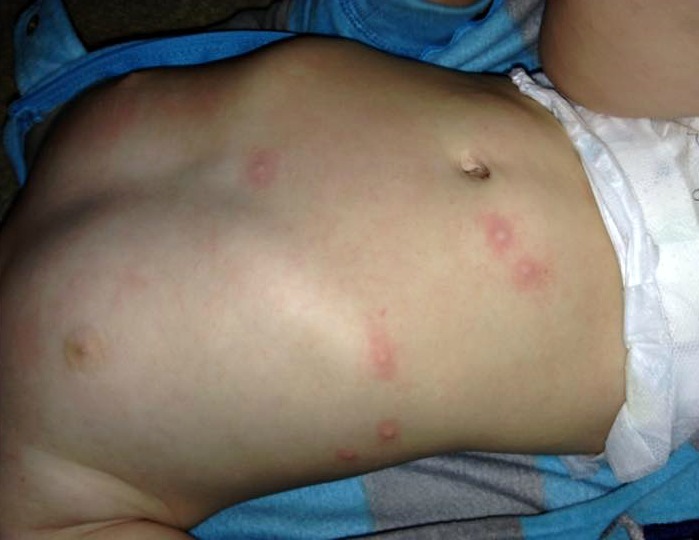 The changing pad cover is from amazon.com. 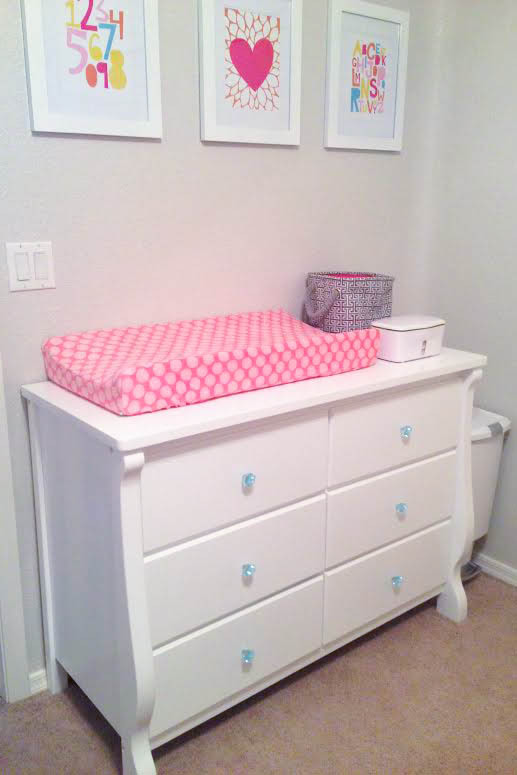 The gray basket on the top of the dresser was a gift at the baby shower. been buying over the years while we were waiting for our little blessing! 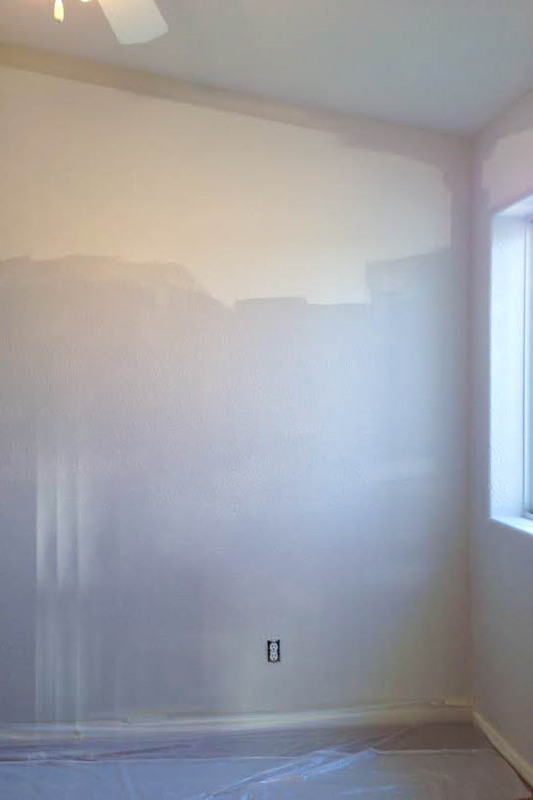 The overall color of the room is tempered gray by Valspar. 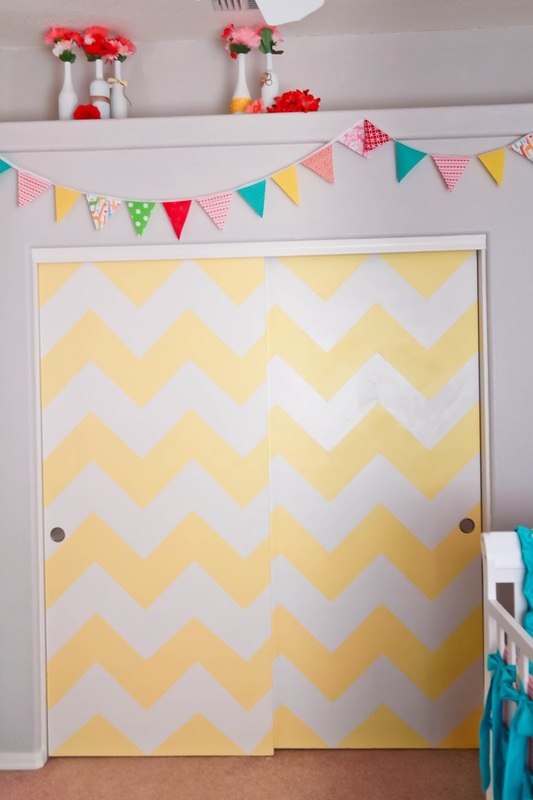 I think it is the perfect gray for a babies room since it isn't too dark. 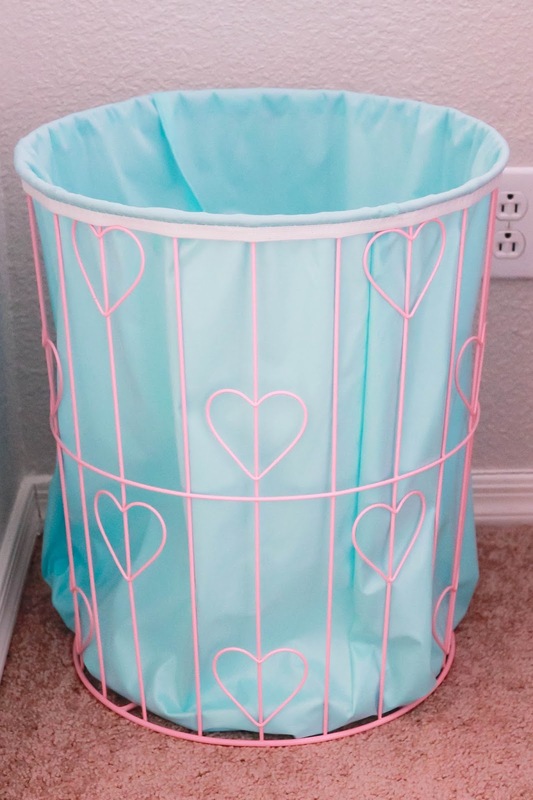 And last is my super cute clothes hamper from target. It was on clearance for $10. 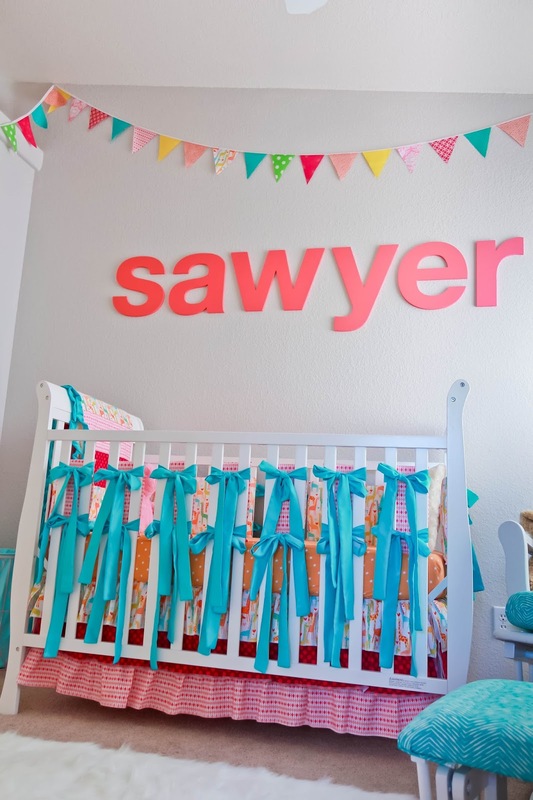 I hope you all enjoyed Sawyer's Nursery Tour! To stay up to date with Whitney, Nick and soon to be baby Sawyer follow her below! 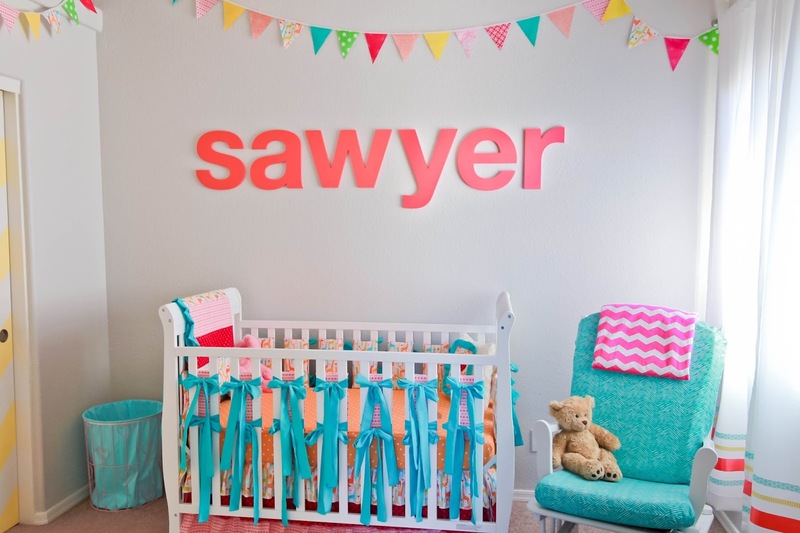 My little girls name is Sawyer too! That's how I came across your blog... 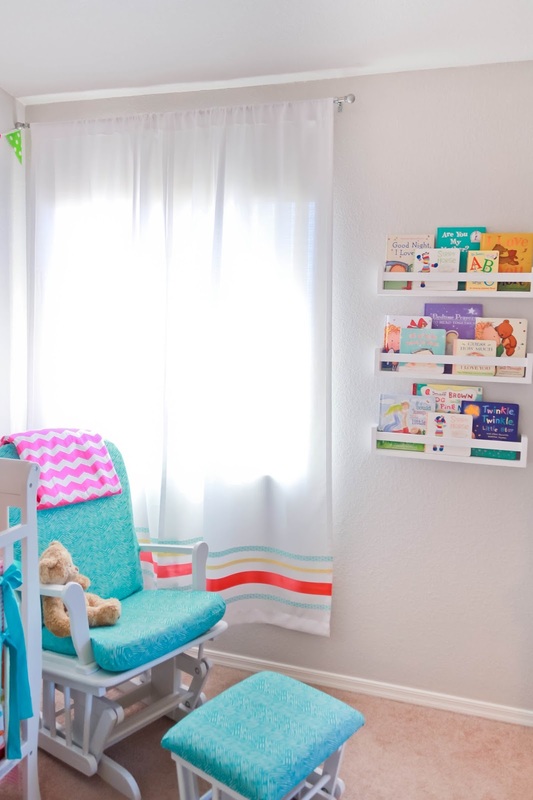 I love the nursery and am going to attempt to make the bookshelves. That's my favorite! The curtains too. Iron on hem tape huh? I love it! Ps. 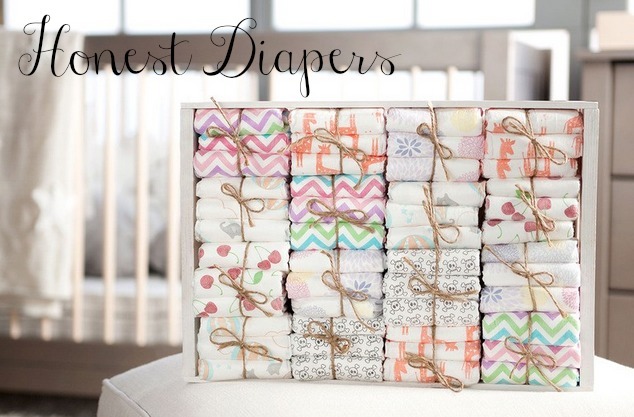 We also heart cloth diapers! !